This morning I delivered a large painting to Castle Inn at Crane Estate, Ipswich, MA. Castle Inn has been displaying and selling my paintings since 2011. The work I do fits well into the beautiful Castle Inn as I hope you will agree. Below are a few photographs showing the painting Spring Morning which is 30" x 48" unframed. 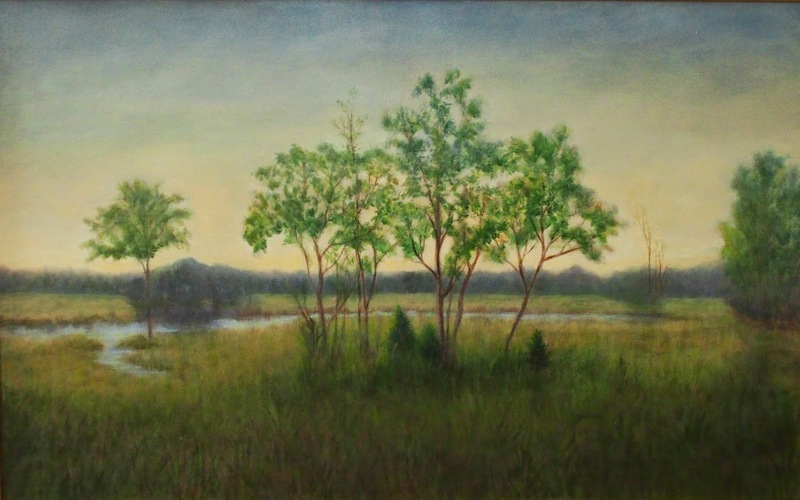 The painting is from a scene of the marsh in Rowley, MA along route 1A which is on my way to Crane Estate. The living room at the inn was being redecorated and Camilla, the Inn Keeper, wanted a large painting over the antique settee used as an accent piece. I offered to paint this piece for them and was given the freedom to choose the design and colors of the painting after discussing the plans for the redecorating of the room. See what you think of how it fits into the room. The painting is for sale and if sold I guess I would go back to the drawing board and start doing another painting. Here are two photographs of the painting in the newly decorated living room at Castle Inn. 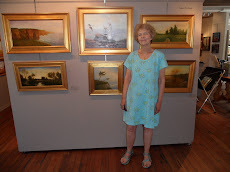 The wall to the left of Spring Morning has two of my other paintings plus my painting in the front entry. Check the Castle Inn at Crane Estate, Ipswich, MA. if you ware coming to this area. There are beautiful views from Crane Estate and a wonderful beach down the road.